In recent year’s Serie A has been considered a great source of talent to be transferred over to other major European leagues. In fact the league has become such a common place for club owners to look that the Italian league players are reportidely prepared to go on strike in a few weeks time if the league’s federation doesn’t change some of their transfer policies regarding players in the last year of their current deal. And nobody in any league is as hungry for new talent as the Manchester City Blues of the English Premier League are. The side currently holds the all time British record for Robinho’s transfer from Real Madrid to the EPL side a few years back for a fee of 42.5 million euros. But that deal really didn’t work out for the squad and now it is being reported that the side hopes to break their current record with another star footballer of Serie A. And perhaps this should be a fitting move considering Robinho just joined the Italian league a few weeks back. Javier Pastore of Palermo is one of the youngest stars of European football and his birth nation is well known for producing sensational footballers. Pastore is titled “The Argentine Kaka” and the attacking midfielder is only twenty one years old. Palermo president Maurizio Zamperini was keen to make a move for the young phenom last January and landed the Argentine star for a mere €6.25 million from Huracan and is now demanding €50 million for the 21-year-old, according to Gazzetta dello Sport. 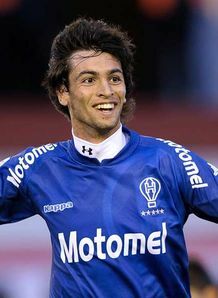 For an Argentine to play in the La Liga is normal, especially for the language. Wearing the jersey of Barcelona with Lionel Messi is a dream, but it remains such. Now I think only of Palermo and the league. Pastore was listed on the 23 man roster this summer for Argentina at the World Cup, but the Palermo man didn’t see any World Cup final minutes. As of now the midfielder will remain with his Italian side, but the “Argentine Kaka” might soon be joining the ranks of Manchester City this January in what would be the biggest move of the January transfer window.